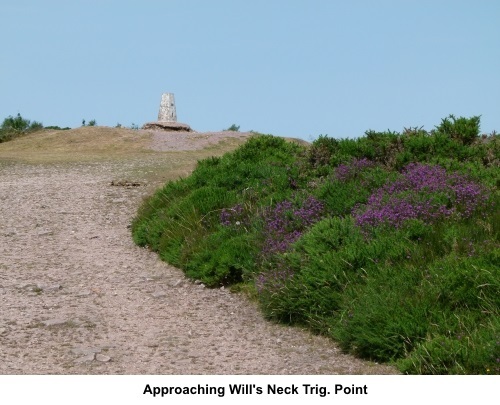 Introduction: Will’s Neck is the highest point in the Quantock Hills at 1266ft (386m). 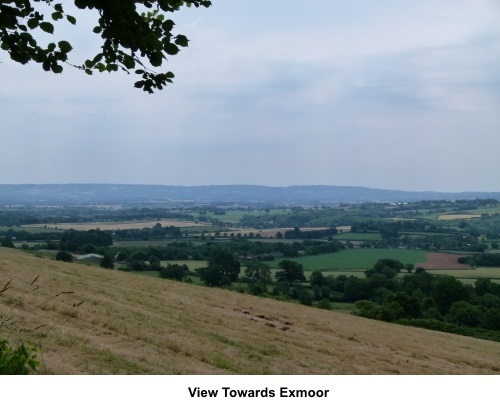 Given good visibility, there are good views to Exmoor, including Dunkery Beacon, its highest point and Selworthy Beacon. 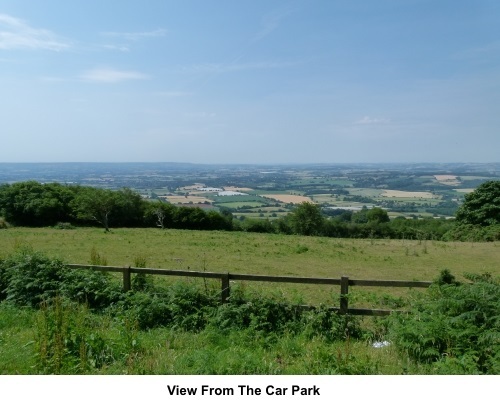 It is also possible to see the Brecon Beacons, the Mendips and Blackdown Hills. 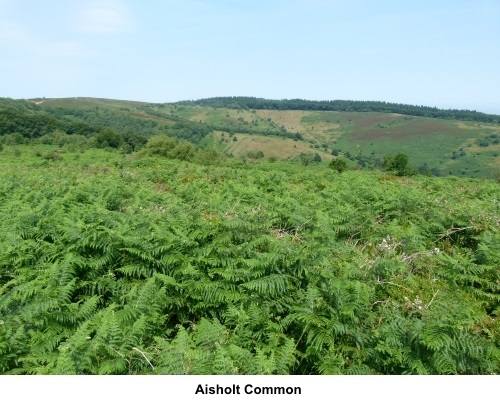 The area is part of a protected landscape of National importance with a variety of flora and fauna, not least common lizards, adders, Dartford warblers, nightjars and bilberries. The unusual name is said to derive from an ancient Celtic tribe known as the Wealas who are believed to have battled the Romans there. That may also be the origin of the name of Wales There are a number of barrows at the site, though not particularly prominent to the uninitiated like myself! You will pass an interesting flood management feature, part of a Hills to Levels project, where logs/brushwood have been used to stem the water flows. 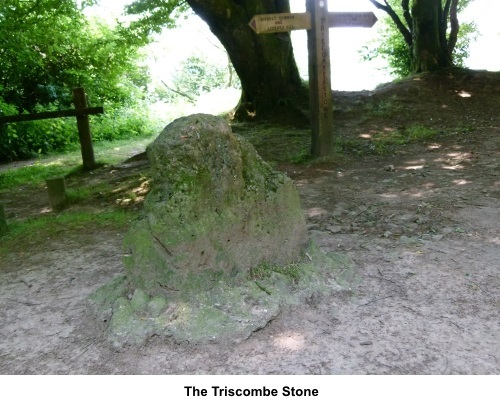 After Will’s Neck, the route passes the Triscombe Stone, said to be a Bronze Age meeting place, for drovers, on their way from Watchet to Lyme Regis. Allegedly, if you sit on it, you will be granted a wish but mine has not come true yet! I have to say this uninspiring small piece of rock did not excite. 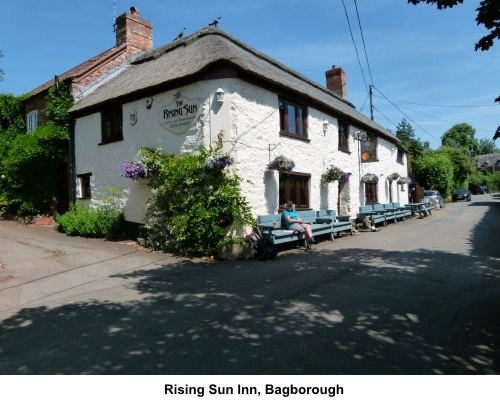 On the exceedingly hot day when I did the walk, it was gratifying to be able to stop at the Rising Sun Inn at West Bagborough! 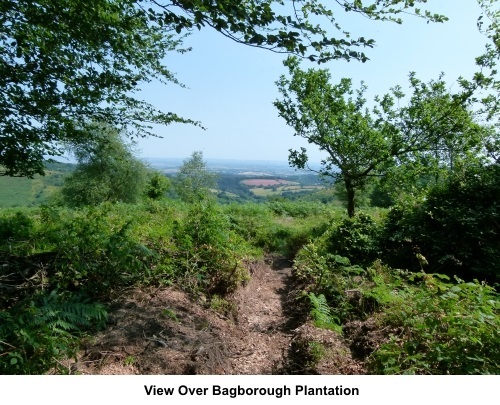 As is often the case on Access Land such that on the higher levels of this walk, there are multiple paths where people have wandered, so describing a precise route can be difficult. 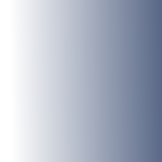 If you can download the .gpx file to a GPS receiver or phone, you might find it helpful. 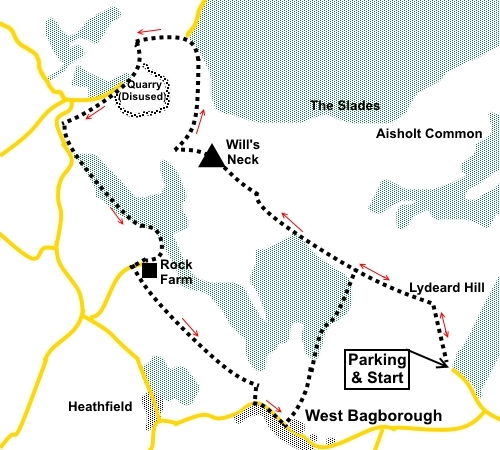 The walk starts from a somewhat obscure car park close to West Bagborough. 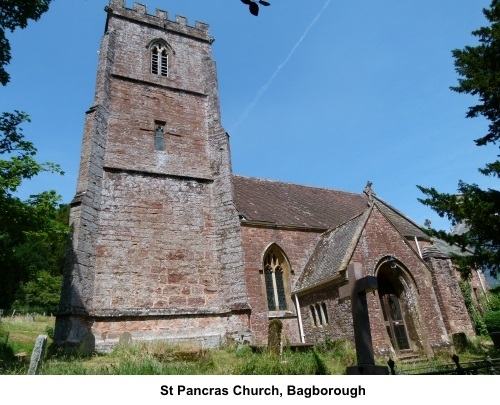 The easiest way to find it is to turn off the A358 between Taunton and Williton to West Bagborough. It is signposted. Follow the road round past the Rising Sun and turn left at the ‘T’ junction. The road ends at the car park. There are good views from the car park before you even start the walk! Start: Go from the car park, through the walkers’ gate next to the information board. 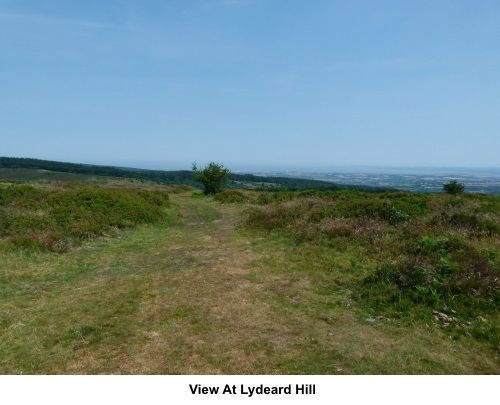 The main track is obvious and goes straight ahead but bear right at about 30° to climb Lydeard Hill first. The track divides after a few yards keep left and when it divides again, keep right, then right again at the next fork. 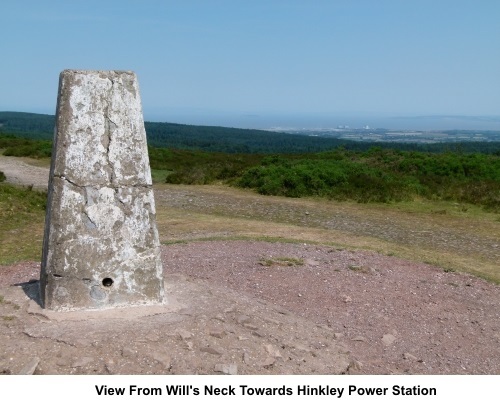 The top of Lydeard Hill is indicated by a cross roads of paths and a good view over the Bristol Channel and to Hinkley Power Station. Turn left at this cross roads. Meet another broad track a (ST 178343) and turn right. Drop down to the edge of the woods and go through a walkers’ gate. Follow the main track ahead. At ST 171347 the path divides and there is a robust post with a yellow footpath arrow pointing straight ahead. Follow this direction to the top of the ridge, ignoring any turns off. Turn right at the top of the ridge and follow the highest level path to the trig. point. As you approach the trig. point, the path splits. Take the path to the left of it. Further on, the path divides again. Take the left fork. 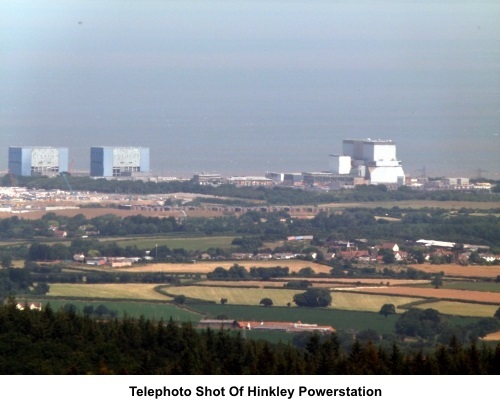 At a somewhat untidy junction of paths, turn right heading almost directly towards the Hinkley power station. Stay on what is obviously the main path as it descends, avoiding any paths that turn off. At ST 164358 pass a similar robust footpath post with a yellow arrow (pointing back the way you have come), to the one seen previously. Just beyond this go through a walkers' gate and follow the path as it bends left. A few yards beyond the gate on the left, is the Triscombe Stone. Make your wish before turning left at the stone (i.e. left off the path you were on) crossing the little mound with trees growing from it and keep straight ahead on the footpath, following the fingerpost for “Crowcombe Park Gate” and “The Drove”. The fingerpost also has a red arrow. Follow the path as it bends left passing a stile on the right which you ignore. The path descends to an old quarry track. Turn right to follow it down, past the quarry gates. Look out for a prominent sign on the right warning of deep water. Shortly after this, turn left off the quarry track to follow a path through the trees, in the direction of a public footpath fingerpost. (ST 159356). Ignore a footpath crossing your route (ST 156354). The path drops to the road but immediately continues off to the left of the road. Ignore the other steeply rising footpath on the left (ST 157351). Almost immediately, you pass a two way fingerpost bearing “Quantock Greenway”. When the path divides, at a marker post marked “Quantock Greenway” keep right following the yellow arrow. Pass a large house on the left and keep on the lower path as it descends, joining a tarmac lane at Rock Farm. Continue down the lane for twenty or thirty yards and go through a kissing gate on the left, a little obscured by the hedge, to follow the obvious path (ST 160345). Initially, the path is parallel with the property boundary and at the end of the property you can see the path heading across the field. Keep to the right of the fence and then the hedge, at the end of the farm wall. The path opens into another field. Follow the right hand boundary. 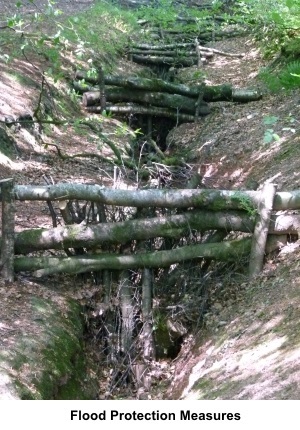 The path drops down to a metal gate, with an integral walkers’ gate, at the end of the field. Follow the obvious route across the next two or three fields, ending in the right hand corner of a field by a large barn. Turn left alongside the barn. Follow to another integral walkers’ gate. Beyond this is a green lane with a number of benches. At St Pancras church, you can either take the path through the churchyard or the one running along the outside of its boundary. Either way, turn right at the end, opposite the church door to follow the path down into the West Bagborough village. At the road, turn left, passing the war memorial. At the Rising Sun pub, turn left up the broad track to its left. The track soon diminishes to a narrow footpath. Follow this until it meets a broad track at a gate which you may recognise from the outward journey (ST 174344). Turn right to follow the main track back to the parking.